Kelan Phil Cohran has had a very productive musical life although I'm not sure that he's that widely known outside of the jazz/post-modern musical world. He's primarily a bandleader. His initial instrument was trumpet. 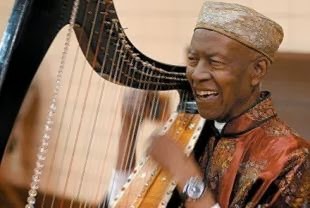 He also plays cornet, psaltery, zither, French horn, frankiphone (an instrument he invented which is similar to a mbira), and various percussion instruments among others. Born in Mississippi he was a talented sideman for people as dissimilar as Jay McShann and Sun Ra. 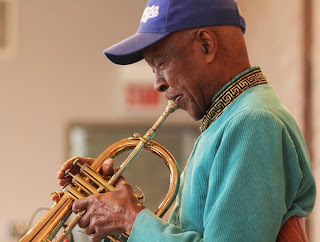 Cohran also was a founding member of the AACM (Association for the Advancement of Creative Musicians). The AACM became famous for its quality of musicians it attracted and for promoting what it called "Great Black Music", a melange of serious avant-garde jazz, blues, and almost every form of black diaspora music as well as classical and other forms of what would come to be referred to as "world music". The AACM sought to challenge music industry exploitation as well as offer free music training to people in inner cities. The AACM gave classes in Hebrew, Arabic and Swahili as well as history. As was unfortunately the case during those times (and today? ), the AACM attracted the thoughtful and negative attention of the Chicago Police Department and the FBI. Cohran has spoken of learning a lot from Sun Ra, who he's said was the most advanced bandleader for whom he ever worked. But Cohran wanted to lead his own band and ground his music a little more firmly in blues traditions. Or to put it another way Sun Ra and many of his imitators or disciples played "out" most of the time while Cohran's compositions, while occasionally way out there, generally tended to have some quite noticeable links to traditional forms. Cohran is a historian and musicologist as well as a musician. He has lectured extensively on music's impact on the body and mind. In any event the period from 1966 to 1975 saw Cohran's new music fit in quite nicely with the rising afrocentric stylings of the time. His first band ,called the Artistic Heritage Ensemble, initially included some people who would become quite heavy hitters later on in their career such as future members of The Pharaohs and Earth, Wind and Fire, Pete Cosey, the guitarist who became famous for his work on Miles Davis' early seventies albums, and conguero Master Henry Gibson, who later worked with Curtis Mayfield. In short if you were a working Chicago jazz or funk musician during the late sixties and seventies you probably were familiar with Cohran's band. And if you were among the best at your craft, you might have been in his group. Along with Miles Davis, Cohran was one of the first modern musicians to explore modal possibilities in jazz. This music is not for everyone. Cohran doesn't write 3 minute pop songs. Because he often skips having a singer the compositions don't always follow the verse-chorus-bridge format. And with the large bands he was using, things could get somewhat dense. There's a lot of different things going on rhythmically. So it's something of an acquired taste. Fortunately from my point of view I did acquire a taste for this music and often play an entire release of his while I'm cleaning the house or exercising or doing some other repetitive task. It's easy for me to get lost in this music. It's not blues, afro-beat, jazz, North African, soul, funk, gospel, classical, Afro-Cuban, arabic, indian, flamenco but all of that and more. You could literally put Cohran anywhere on the planet and he would fit in musically. Obviously he has a extremely deep understanding of musical theory. Occasionally Cohran works with the band, Hypnotic Brass Ensemble, which includes his sons on various brass instruments. I LOVE their song "Cuernavaca". It's a must have as far as I am concerned. "Malcolm Little" is an old school blues. "The African Look" is a song about pride in yourself that wouldn't have sounded too out of place on "A West Side Story". 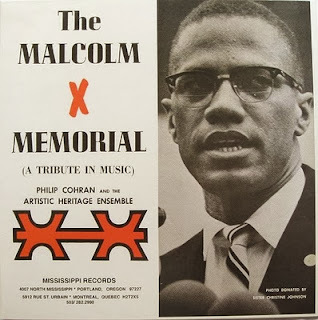 If you were interested in what the marketing term "spiritual jazz" might mean, Phil Cohran was one of its progenitors. I had a pretty interesting virtually idyllic childhood. I heard all kinds of different music not only because my parents were music educators and fans but also because I attended schools that had wildly divergent demographic profiles. One year I'd be in a school where James Brown, The Jackson Five or Freda Payne were what people knew and liked and a few years later I'd be in a school where The Doobie Brothers or Nazareth were the preferred listening material. And then I'd go home where jazz, gospel or blues were likely playing. I can probably thank one of my private school teachers for getting me hip to such folks as The Allman Brothers or Free. Back in the day FM radio was not quite as regimented or as segregated as it is now so I heard different styles there as well. One day I will have to do a post on legendary Detroit radio host/dj The Electrifying Mojo, who I think deserves a special mention. Anyway I write all that drivel to point out that although stereotypically I probably wasn't in the target demographic for Bad Company there was a time in the seventies and eighties when it was difficult to avoid hearing them in the circles I was then frequenting. When I purchased a "Best of .." release it was funny to me how many of their songs I already knew. The older you get the more stuff that is just rattling around in your head waiting to be triggered. Anyway the best thing about Bad Company was not really the guitar solos, which for my money were workmanlike and pedestrian but the vocals and, rarely, the songwriting. Bad Company had former Free frontman Paul Rodgers handling the vocals. I wouldn't go so far as to call him soulful but his voice was definitely earnest and very expressive. Basically to me he and Tom Jones sounded about the same, more or less. 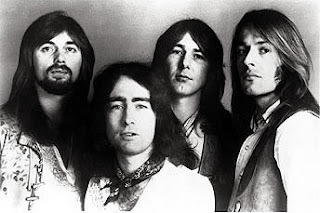 Bad Company grew out of the ruins of Rodgers' former group Free. Obviously vocally the groups were quite similar but musically Bad Company leaned in a slightly more pop direction than Free did. Bad Company also had members from other groups such as King Crimson and Mott the Hoople. Bad Company was much more financially successful. After their initial albums the ratio of bad music to good music got a little too high for me but no one has a limitless supply of creativity to call upon. I liked some of their hits though. These included the Hendrix inspired elegy "Shooting Star", the ominous "me against the world" tune "Bad Company", the nod to funk of "Live For the Music", the hard rock boogie "Can't Get Enough ", the country tinged "Feel Like Making Love" , the ballad "Ready for Love" (this was used in "Supernatural" when Dean and the angel Anna got busy so I now associate the song with that scene), the ballad "Silver, Blue and Gold", the travelogue "Movin On" and many others. This wasn't quite a favorite group of mine. I won't be chasing down every note they ever recorded as I try to do for Hendrix or James Brown. But all the same if I'm driving and hear their music on the radio I will usually turn it up and sing along.